BMW took the wraps off the 2019 Z4 in August last year, now it seems that they are getting the car ready for the India launch. The Z4 will be one of the 12 new models that the German carmaker plans to launch in India this year. With 12 new offerings set to be launched in India, BMW has big plans for India this year. The company released a teaser video on their Twitter and Instagram platforms a few days back, showcasing a car that cannot be mistaken for anything else but the new 2019 Z4. And now they have officially unveiled and announced it for India. BMW first revealed the 2019 Z4 globally in August last year. Test mules of the car have been spotted in India since then. The one that went through homologation is rumoured to be Z4 M40i. This one gets a 3.0-litre, straight-six, twin-turbo heart that delivers 340bhp and can do the 0 – 100km/h dash in just 4.6 seconds. Apart from the straight-six, BMW may also bring in the sDrive20i trim with 2.0-litre inline-four that develops about 200 horses and 320Nm. 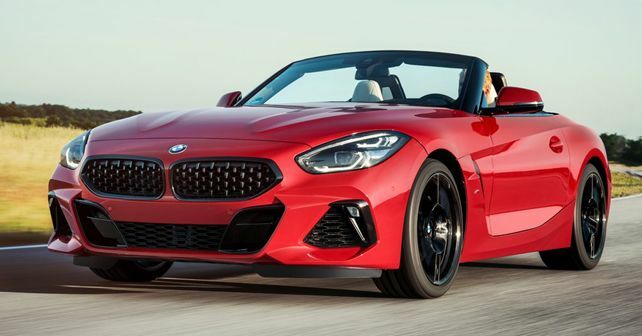 This trim should make the 2019 Z4 relatively affordable and accessible to a larger audience. To ensure that the Z4 stays true to the BMW driving experience, it has been fitted with sports suspension with electronically controlled dampers, M-Sport brakes and differential. The 50:50 weight distribution of the car should further give it improved handling capabilities. In terms of design, the new Z4 will now follow the rest of the BMW line-up. The front kidney grille is wide and gets a prominent surround. In fact, the front air dams, alloy wheels and the rear bumper, all give the new Z4 a much more muscular stance. The headlamps and tail lamps are a lot sleeker than before too. This third-gen Z4 is expected to be launched around the Rs 90 lakh mark. At that price point, the car will compete against the likes of the Porsche 718 Boxter, Jaguar F-Type Convertible and Mercedes-AMG SLC 43.